Please take a moment to vote for The Hunt and The Summoning on this list! Click here for the short story 'The Fever'. 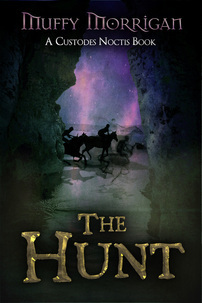 The Hunt, Morrigan's second novel, published under the Three Ravens book label, was named 74th on Amazon's Paranormal bestsellers list in September 2010. The earth has long been the battleground between the forces of Light and Dark. There have been wars that have torn the world apart many times. The Custodes Noctis were created to help fight in those wars, and through the millennia have faced many Dark foes and driven them through the Veil into the Between World. But the world is changing, things are stirring that haven't seen the light of the sun for epochs. The oldest family of Custodes Noctis, the Emrys, have fought on the side of the Light for thousands of years. Now, Rob Emrys is being called by something sinister and unseen, a command he must obey. While his brother, Galen, desperately attempts to save his brother, Rob finds himself unwillingly summoned to what could very possibly be his death—or worse. Being Custodes Noctis, a Keeper of the Night, is an honor reserved for those of ancient bloodlines chosen and trained to protect the world from the evil that even the dark fears. The job is full of deadly perils and serving Custodes Noctis are linked to their brother by a psychic bond, one that lets them survive or leads to their death. What happens when a fledgling Custodes Noctis must face the world alone? When the memory of his brother's death by his own haunts him, and his Gifts as a Keeper are out of control? With his past firmly in view, Rob Emrys sets out on the journey dictated by an ancient prophecy, one he is determined to see come to pass.